Convinced that her son’s violin is a satanic snare, a stern Scottish matron casts his beloved instrument into the fire. Accosted by a mob about to burn him in effigy for a false accusation, a gracious Scottish man wins over his accusers with humor and humility. The former is George MacDonald’s grandmother, whom he immortalized as the violin—burning grandmother in Robert Falconer. The latter is his father, with whom he had a relationship C. S. Lewis called “almost perfect.” These two contrasting personalities represent the dominant forces that shaped MacDonald’s theology: the Scottish Calvinism of his era and the Celtic influences of his heritage. MacDonald wrestled deeply with their divergent perspectives of God. He came to believe that Truth is not to be found in a theological system but in a person, Jesus Christ, who calls people to follow him in all aspects of their lives. “Our business is … to live truly,” he wrote. Only as we live truly “will there be a possibility of our thinking correctly.” Faith is a song that must be lived as well as sung. Federal Calvinism provided the early scaffolding of his faith. Rather than affirming God as the Father who loves all of humanity and who freely forgives all through Jesus Christ, Federal Calvinists believed that God’s love and forgiveness had to be purchased by the payment of Christ’s sufferings on the cross. God was sovereign over all things and had chosen to love only the elect. This development of Calvinist belief arose in the late 16th and 17th centuries and became a dominant expression of Christianity in Scotland. MacDonald wondered how the Creator and Redeemer could be described by his church as less loving and just than his own father. He agonized to think of God as a potentate supremely concerned about His own glory and establishing a system of limited atonement. In Weighed and Wanting he describes feeling as a child that he didn’t want God to love him unless God loved all people. Thus he began to associate God more with his father’s noble and caring character than with the wrathful God of his catechesis. MacDonald’s father affirmed beliefs more closely associated with Celtic Christian traditions, which derived in part from the desert tradition of the ancient Coptic church and placed central emphasis on the triune God of love. MacDonald was influenced by his father’s egalitarian and generous attitude towards all people and by his desire for unity within the church. 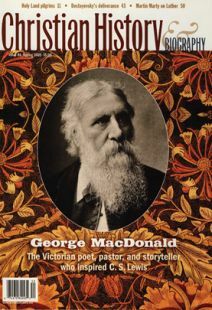 George, Sr., rejected the extreme points of both Calvinism and Arminianism and hated to see the gospel mystery torn “to pieces by those who believe there is no mystery in the Scriptures and therefore attempt to explain away what is evidently for the hour of God to conceal.” MacDonald wrote later that his father bred in him the sense that fatherhood was at the world’s core. MacDonald retained some aspects of the Calvinist teaching from his youth, including his grandmother’s involvement with the poor. He held fast to the sovereignty of God, whose grace is unconditional and who alone deserves human devotion. The belief that God is sovereign gave MacDonald the freedom to challenge any theological system that claimed to be absolute. For MacDonald, God’s sovereign power is the power of love. The “love of the Son to the Father” is what “unites the universe.” He therefore rejected what he perceived to be a Calvinist dichotomy between God’s love and wrath. He believed that God’s wrath is an expression of the consuming fire of divine love that purifies from sin, “that his life might be our life, that in us, too, might dwell that same consuming fire which is essential love.” Thus, punishment has a redemptive purpose to set people on the right way and to deter them from what is wrong. Despite his emphasis on God’s love and his hope that all would be saved, MacDonald left no room for cheap grace. He was fond of saying, “God is easy to please, but hard to satisfy.” We are called and empowered by the Holy Spirit to become one with God, to will and love what God wills and loves. Freedom is not entitlement to choose one’s own way, but the gift to walk with God in the way of self-giving love. “Obedience is the soul of knowledge,” but disobedience is the way of destruction. MacDonald believed that wisdom is gained through the willingness to relinquish possessions, security, and control and to follow Christ regardless of the cost. Central to much of his writing is the theme of pilgrimage, in which the protagonist moves from a materialistic worldview to a more sacramental embrace of life and creation. Like Celtic heroes, called peregrini, the wanderers in MacDonald’s Celtic—like stories grow in their love and compassion to the point of being willing to die for the sake of others. He believed that through dying to oneself, one develops the character and strength to be a true witness (martyr) to the nature of love that is at the heart of the universe. Whether Irene and Curdie in the Princess books, Anodos in Phantastes, Vane in Lilith, or Robert Falconer, MacDonald’s protagonists come to perceive meaning and music in nature, the interrelatedness of all of creation, and beauty at the heart of all things. They experience a baptism of sorts, which cleanses, heals, and engenders joy. And through the pilgrimage of relinquishment, suffering, and “death,” they experience an enlivening of imagination that leads to greater empathy, creativity and courage. Celtic Christian emphases such as both feminine and masculine characteristics of God, the value of beauty and the arts, the importance of the Trinity, the dignity and worth of the stranger, the importance of community, and a love for God’s creation are evident throughout MacDonald’s work. Kerry Dearborn is associate professor of theology at Seattle Pacific University.